Louisville, Ky. - Celebrating its 115th year, the World’s Championship Horse Show was held at the Kentucky State Fair’s famed Freedom Hall from August 19-26, 2017. With purses totaling over $1 million, the World’s Championship Horse Show is the crown jewel of competitions for American Saddlebreds, Hackney Ponies, and Roadster horses. Nearly 2,000 horses and ponies competed for the coveted trip down Freedom Hall’s victory lane, and exhibitors ranging from 7-year-olds to people in their late 80s enjoyed every moment with their equines at the show. Throughout the eight-day show, the American Saddlebred Horse Association (ASHA) was widely visible and busy. Each day, the ASHA honored Members of the Day from across the country who have tirelessly given back to the American Saddlebred breed and industry. ASHA staff also worked through each evening to produce the “American Saddlebred Daily” publication, which featured results and judges’ cards from the previous days, as well as photos highlighting each day’s most exciting moments. The ASHA Youth Committee outdid themselves this year, producing the junior judging, golf cart decorating contest, selfie scavenger hunt, and photo cutout backdrop, allowing all attendees a chance to “present” the 2016 World’s Grand Champions. The ASHA continued one of the show’s most special events again this year, the Inaugural Exhibitor and Trainer presentation. On Tuesday evening, 120 first-time exhibitors and six first-time trainers were presented with First-Timer Ribbons and a group photo taken by Howard Schatzberg. The American Saddlebred Registry (ASR) was well represented at the show as well and awarded Breeder’s Award Medallions to the World’s and Reserve World’s Champions in many American Saddlebred divisions. ASR also awarded prize money in the ASR Futurity and Sweepstakes classes. The World’s Championship Horse Show peaked on Saturday evening, known as stake night to all those who hold the show with the highest affinity. On this night, tried and tested horses met their match in new combinations, all vying for the top prizes. No stranger to the winner’s circle in equestrian competition in various forms, Misdee Wrigley Miller kicked off stake night by winning the Ladies Three-Gaited World’s Champions of Champions title with her beloved mare, CHHS Baby Steps. This was their third year in a row to earn this title. Miller’s niece, Ali DeGray, also had a successful stake night, winning the Roadster Pony World’s Grand Championship with Twin Willow’s McDreamy, also for the third year in a row. Additionally, DeGray won the Hackney Pony World’s Grand Championship with Heartland High Tech. Another fixture of the American Saddlebred community, Elisabeth Goth, scored two big wins on stake night, capturing the Fine Harness World’s Grand Championship with Here Comes the Boom, as well as the Amateur Five-Gaited World’s Champions of Champions title with CHFox Grape’s The Tiger Lily. Holli Hayes, of the ever-successful Majestic Oaks Hackney Farm, scored her first Harness Pony World’s Grand Championship with Mississippi Queen for owner Charlotte Wrather. Debbie Foley and B52 scored their second consecutive World’s Grand Championship in the Roadster to Bike division for owner Scott Hagan. Hagan himself competed on stake night to finish Reserve World’s Grand Champion in the Three-Gaited division with HS Daydream’s Heads Up. Notable horseman and author Smith Lilly won the Three-Gaited World’s Grand Championship aboard Tango’s Token Kiss for owner Grace Arnold. They also earned that title in 2015. 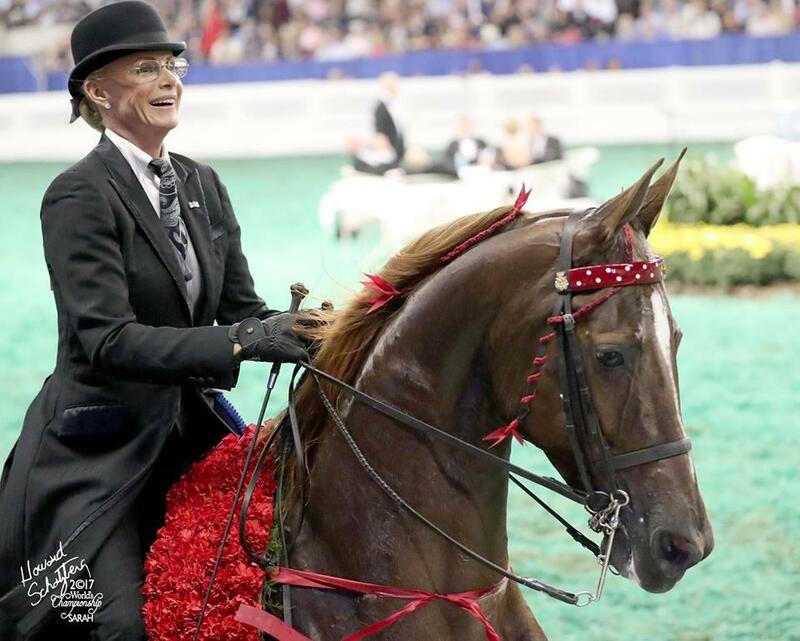 Barbara Goodman Manilow is always busy presenting her string of top American Saddlebreds at the World’s Championship Horse Show, and this year was no different. Aboard her bay beauty, Espresso Noir, she won the Amateur Three-Gaited World’s Champion of Champions title for the second year in a row. A popular and successful owner and breeder for many years, Mary Gaylord McClean also had a wildly successful stake night. Paired for the first time this season, Vegas Moon and McClean continued the five-year-old mare’s undefeated career by winning the Ladies Five-Gaited World’s Champion of Champions title. 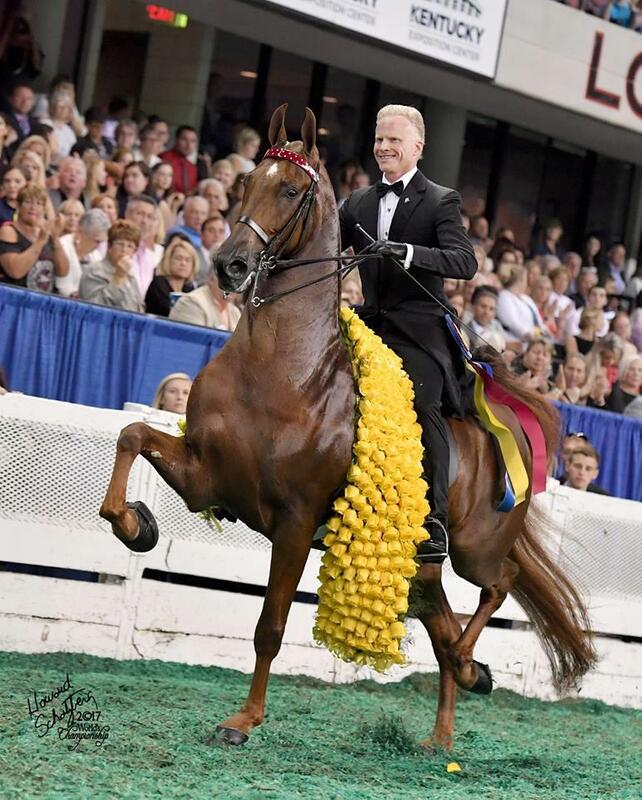 Later in the evening, McClean’s homebred WGCTop Of The Mark was crowned the Five-Gaited World’s Grand Champion with trainer Tré Lee aboard for the second year in a row. The Five-Gaited World’s Grand Championship is the pinnacle of American Saddlebred competition. The scene was set for the much-anticipated rivalry, with each competitor entering the ring to the tune of “My Old Kentucky Home” with a standing ovation. The crowd was quick to choose their favorites, and after initial rail work and conformation evaluation, Honey Badger, presented by Matt Shiflet for the Athanasuleas family; (SA) Kalarama’s Ultimate Choice with Tammy DeVore for Helen Rich; and WGCTop Of The Mark with Tré Lee for Mary Gaylord McClean’s Golden Creek Farms were called on for additional work in an exciting workout. In the end, WGCTop Of The Mark topped the field, with Honey Badger in second, and (SA) Kalarama’s Ultimate Choice in third. For full results and judges’ cards and more information about the American Saddlebred breed, please visit the American Saddlebred Horse Association website. Learn more about the American Saddlebred breed and watch trainer Smith Lilly’s tips of the trade for making them a winner in the show ring in our US Equestrian Learning Center video. Click here to see a gallery of our favorite photos by Howard Schatzberg.